Polk has just dropped an announcement concerning the the retail availability of its most recent bookshelf loudspeaker, the Polk Hampden. The Hampden has been specially designed to function as either a near-field desktop audio solution or an extension of a larger home theater system, where it boasts of Bluetooth connectivity while offering impressive, room-filling sound in an attractive package. The Polk Hampden will blend in high quality audio alongside an elegant home décor aesthetic thanks to its stylish, retro-meets-contemporary design. It will be constructed in an all-wood cabinet accompanied by a curved teak wood veneer which will be offset by an all-white front with glass-filled, nylon bezels. In order to control the level of volume, the loudspeaker will boast of an intuitive rotary wheel, which is not only simplistic but iconic in its application as well, enabling users to effortlessly alternate sound levels. 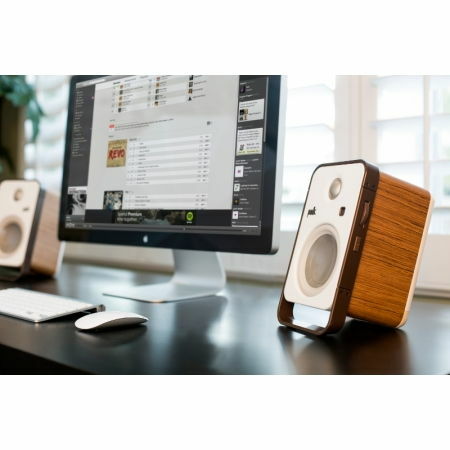 While majority of the desktop speakers out there have been designed with the aim to deliver sound at the listener’s chest, Polk would take a “laid back” approach with Hampden, where it angles the sound stage upward in order to ensure a more optimal and immersive listening experience. The system itself will be powered by a pair of 1-inch, soft-dome silk/polymer tweeters and a couple of 4.5-inch polypropylene woofers with rubber surrounds. Individual drivers and tweeters will also sport a dedicated amplifier, resulting in an exceptionally natural sound and clarity throughout the frequency range. Not only that, Polk will also throw in a fully digital amp that bypasses a computer’s digital to analog converter as it handles the full range of the Digital Signal Processing when connected via USB. The asking price? The Hampden is going for $399.95 a pop for interested parties.